If you are entering Japan via Narita Airport, you can exchange your Japan Rail Pass voucher for a Japan Rail Pass as soon as you arrive. At Terminals 1 and 2, there are JR Ticket offices where you can fill out a form and present your passport to activate the Pass right away so that you can use it to board the Narita Express to Tokyo. A good way to start your Tokyo sightseeing is by exploring the Asakusa district, known for its ancient temples and shrines. Take the JR Yamanote, JR Keihin Tohoku, or JR Chuo Lines to Ueno Station and enjoy a 20 to 25-minute stroll along the shopping streets of Nakamise and Shin-Nakamise, which both lead to the Asakusa Shrine, Sensoji Temple and Dempoin Temple. 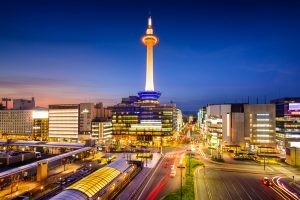 Other notable attractions nearby are the Sumida Park, Asahi Tower and Tokyo Skytree. In the afternoon, head to Harajuku by taking the JR Yamanote Line. Visit the Meiji Shrine and do some more shopping at the numerous shops and boutiques along Takeshita Dori and Omotesando. 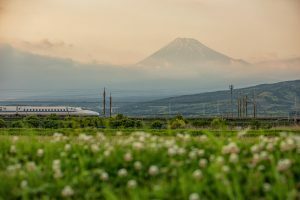 Use your JR Pass to take a Shinkansen from Tokyo to Kyoto. The one-way trip takes around 2.30 – 3 hours and, once in Kyoto, you can begin your tour of the city with a visit to Arashiyama, which you can access from Kyoto Station via the JR Sagano Line. From Saga-Arashiyama Station, enjoy a 10-minute walk to the district’s central area. Visit the Bamboo Groves, temples (Tenryuji, Daikakuji, Jojakkoji and Nisonin), and take the Saga Scenic Railway tour or the Hozu River Boat tour. Northern Kyoto – Visit the Kinkakuji Temple, Ninnaji Temple and Ryoanji Temple. Eastern Kyoto – Walk the entire length of the Philosopher’s Path, while making a few stops along the way to visit some World Heritage temples located nearby (Ginkakuji, Nanzenji, Kodaiji and Kiyomizudera). 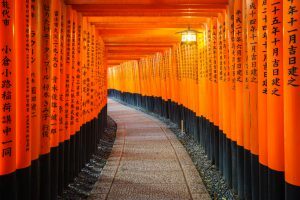 Southern Kyoto – Climb to the top of Mount Inari, following the trails of thousands of torii gates that lead to the main shrine. Travelling from Kyoto to Hiroshima takes about 2.5 hours. Use your JR Pass to board a JR Kyoto Line train going to Shin-Osaka Station. Then transfer to a Shinkansen headed to Hiroshima. Hiroshima’s downtown area has loads to offer when it comes to shopping and eating. There are shops and department stores, as well as restaurants that serve the city’s specialty food: okonomiyaki. Explore the Hiroshima Peace Park and learn about the devastation that destroyed the city during World War II. 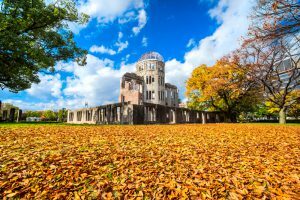 It consists of the ruins of the Prefectural Industrial Promotional Hall (which is now known as the A-Bomb Dome), Peace Memorial Museum, Cenotaph for the A-Bomb Victims and Children’s Peace Monument. Next, visit Hiroshima Castle and check out its main keep and the Ninomaru. Then drop by the Shukkeien Garden, which is situated a few minutes’ walk from the castle. To return to Tokyo, take a Shinkansen headed to Shin-Kobe, then transfer to a Shinkansen going to Tokyo. From Tokyo Station, you can get on the Narita Express to reach Narita Airport. The entire journey takes around 5 to 5.30 hours and is covered by the JR Pass.